Cancer Research UK and Weight Concern have joined forces to develop Ten Top Tips for a healthy weight, as part of our Reduce the Risk campaign. Ten Top Tips is a programme that encourages you to make lifestyle changes to take in fewer calories through food and burn more calories through activity. Following Ten Top Tips will help you to lose weight safely and avoid putting on more weight. These tips have been designed to fit into your daily life and are based on the best scientific evidence. Keeping a healthy body weight is one of the best ways to help reduce your risk of cancer. Current levels of overweight and obesity in the UK could lead to around 19,000 cases of cancer each year. The tips are simple habits that everyone can permanently fit into their daily routines. Keeping up all ten tips in the long term will help you lose weight and keep it off. Keep to your meal routine. Try to eat at roughly the same times each day, whether this is two or five times a day. For more information, go to our Eating Habits section. Go reduced fat. Choose reduced fat versions of foods such as dairy products, spreads and salad dressings where you can. Use them sparingly as some can still be high in fat. For more information, go to our Hidden Calories section. Walk off the weight. Walk 10,000 steps (about 60-90 minutes of moderate activity) each day. You can use a pedometer to help count the steps. You can break up your walking over the day. For more information, go to our Walking section. Pack a healthy snack. If you snack, choose a healthy option such as fresh fruit or low calorie yogurts instead of chocolate or crisps. For more information, go to our Healthy Meal Ideas section. Look at the labels. Be careful about food claims. Check the fat and sugar content on food labels when shopping and preparing food. For more information, go to our Look at the Labels section. Caution with your portions. Don't heap food on your plate (except vegetables). Think twice before having second helpings. For more information, go to our Portion Caution section. Up on your feet. Break up your sitting time. Stand up for ten minutes out of every hour. For more information, go to our Keep on Moving section. Think about your drinks. Choose water or sugar-free squashes. Unsweetened fruit juice contains natural sugar so limit it to 1 glass per day (200ml / 1/3 pint). Alcohol is high in calories; try to limit the amount you drink. For more information, go to our Hidden Calories section. Focus on your food. Slow down. Don't eat on the go or while watching TV. Eat at a table if possible. For more information, go to our Eating Habits section. Don't forget your 5 a day. 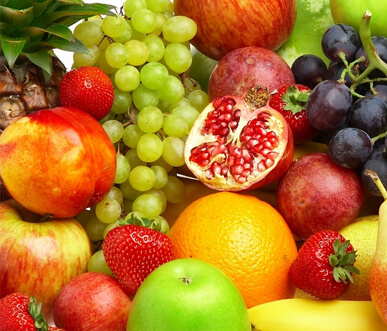 Eat at least five portions of fruit and vegetables a day (400g in total). For more information, go to our Five a Day section. The Ten Top Tips programme helps you incorporate the lifestyle changes into your daily routine so that they become automatic. Keeping track of whether you have successfully completed the tips on a daily basis is important for sticking to them. Read on to find the Ten Top Tips tick sheet, and other important hints for sticking to the tips. You can also download a copy of the Ten Top Tips leaflet or you can order a copy from our For professionals page – just click on the 'order form' link. We also have a handy shopping card that can help you make sense of food labels and make healthy choices.